Happy 2009!! I hope everyone had a wonderful time ringing in the New Year! Since it snowed all day yesterday and was frigid cold here, I stayed home and watched the ball drop on TV. And, I was productive at the same time! 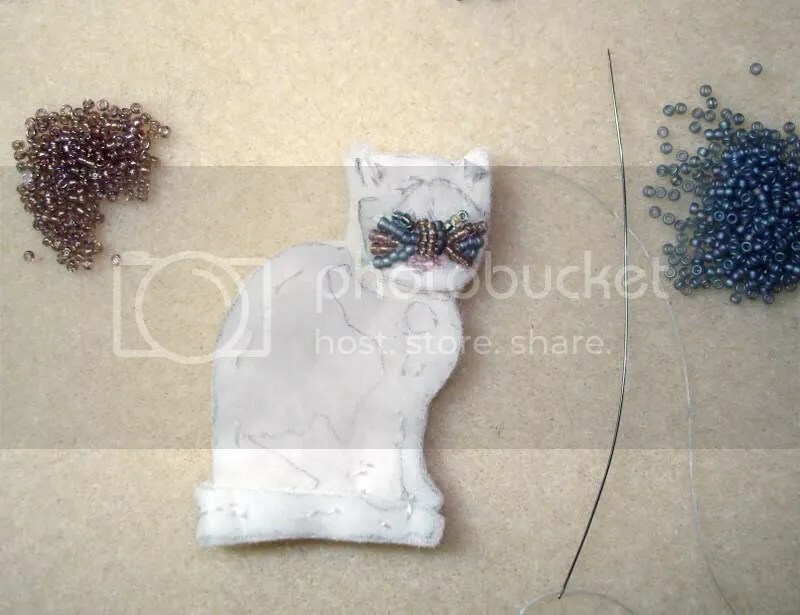 I worked on my latest commission – another beaded cat! The woman who purchased Einstein from my Etsy shop loved him so much that she wants a long-haired cat to keep him company! I will call this cat Milo, inspired by my friend’s crazy cat. So far, I have completed the first layer of beadwork. 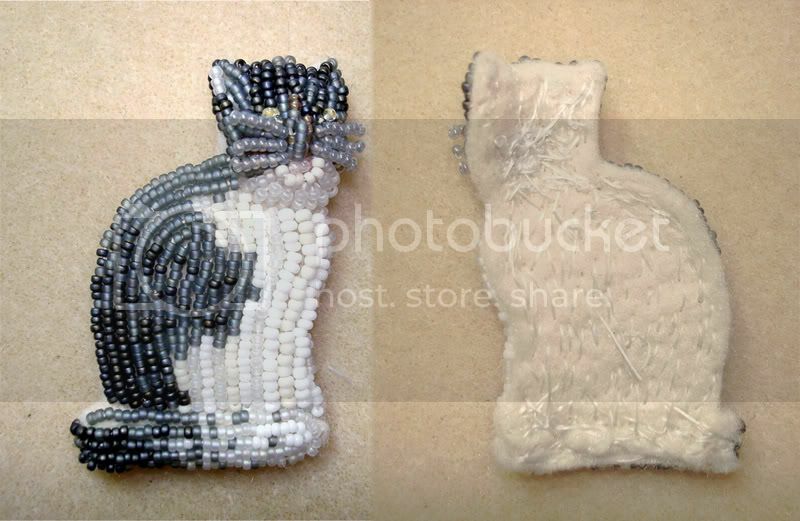 I am using 8 or 9 different shades of gray & white size 15 seed beads, as well as a few 11’s. Milo’s tail is wrapped around the front of his body, so you can’t see his feet. Next, I have to add some fringe for hair! How do you think he looks so far? Semi-beaded Milo the Cat brooch. 2″ x 1- 1/4 wide” (5cm x 6cm). Get stickers & mailing labels for my shop. Order small jewelry boxes that are made in the USA. Keep accurate records of all my business expenses. Design new product types while maintaining my personal style. Add new items to the shop regularly. Start sending out The Lone Beader’s newsletter. Find new places to show my beadwork. Continue to work on my beaded pop art cars & vehicles. Work on my beaded self portrait series. Go bead shopping in Venice, Italy & Murano. What are your plans for 2009? >Love the new cat. Bead shopping in Italy? I am coming with you:):)Hope you have a great 2009. >Well, it sounds like enough to keep most people busy for a long time, but I figure for you a year will do it. Have a good New Year! >bead shopping overseas in person (not online)! now that is an excellent goal! >Cheers, LB! Here’s to all of us obsessed by these little bits of glass – may we all reach our goals this year!! >I have been dreaming of Italy for a long time, but first, I would need to go to Sweden, finally. The dream has existed for a longer time. :)I can’t wait to see your beading kit and of course seeing you accomplishing all your other goals, too. >Wow, your beading is amazing! >Plans for 2009? Well, I hope to reopen my crafty etsy store soon–2 weeks max. I would also like to get a website for my fabric store.I came over from etsy forums. I love your avatar, it always catches my eye! >Kudos for accomplishing everything that was on your last list and starting a new one! I’ve been too preoccupied to think about to-dos for 2009…I should really get on that! >Go bead shopping in Venice, Italy & Murano. What a great goal to have!My goal is to start by writing down some goals. I always have goals but writing them down is important. Keeps you honest and also a constant reminder. >Wow, fabulous beadwork I love your dod & cat pins, great job.Best wishes to you and your family in 2009. >Happy New Year!Hope 2009 is a great year for you! >Milo is really cute. Oh you are so organised already. I look forward to the art pieces you plan on doing. Me..learn to take better pictures and I plan on learning how to use photoshop, also will try and see a bit more of the UK this year.